The existing 460-ton chiller plant in the basement of Olscamp Hall was converted from a standalone plant serving just Olscamp Hall to one that could ultimately support up to six buildings. A chiller capacity upgrade included the addition of a 500-ton chiller with provisions for an additional 500-ton chiller. Two new 500-ton cooling towers were installed on the roof of the building with provisions for a third tower, requiring considerable structural revisions. Due to the height and visibility of the towers, a new screen wall was designed to conceal them from view. Also included in this project was the removal of the existing chilled plant in the Business Administration Building. 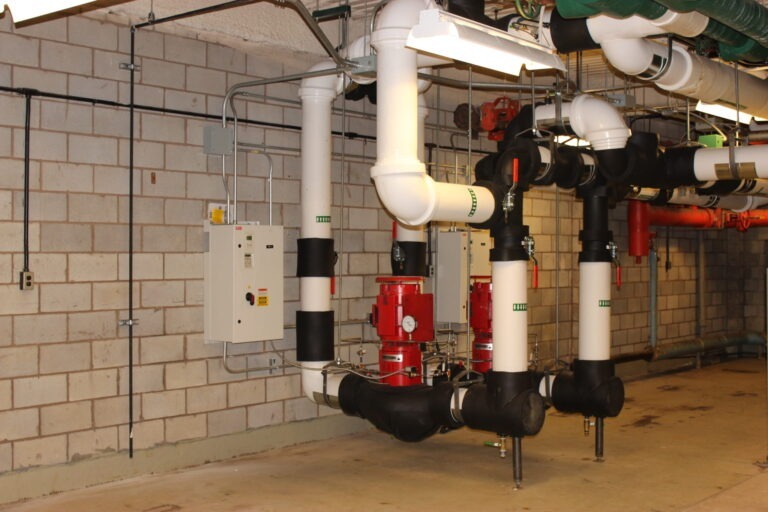 New chilled water piping was extended from the Olscamp Hall Chiller Plant CCP-3 to the Business Administration penthouse, where new chilled water pumps were installed to supply the existing air handling units. Plant was designed for future expansion to a 1,500-ton plant with a variable primary pumping system. HAWA was the lead professional on the project, leading a team that included an architect, structural engineer, civil engineer and hazardous materials consultant. HAWA also designed the HVAC and electrical components of the project and provided construction administration services.